Enjoy safari among virgin African bushes, the Selous Game Reserve, which is also the largest reserve in Africa. This park is not only easily accessible by road from Dar es Salaam but also by air from Zanzibar, Ruaha, Mikumi, Arusha, or Serengeti. Selous Ngalawa Camp can incorporate Selous Game Reserve into a longer itinerary that includes the usual highlights of a Tanzania safari or offer short packages to only Selous according to your desire and this three-day safari will just be perfect for you. Children policy: children with the minimum age of 12 are allowed to join this safari. This camp is a newly opened camp, bordering Africa's largest protected area, the untamed Selous Game Reserve. The Selous Ngalawa Camp, situated in its own forest reserve, is the original camp set up along the mighty Rufiji River near the Mtemere Gate, the eastern gate to the Selous Game Reserve. Notes: The camp is a budget safari with accommodation in bog en-suite tents where you can enjoy an authentic experience in the heart of the wild nature. There is no AC or electricity overnight. There will be a possibility for cold-showers, but please make sure to bring your own toiletries. In the morning at 08:30, you will be picked up from your hotel in Dar es Salaam and drive to Selous Game Reserve. 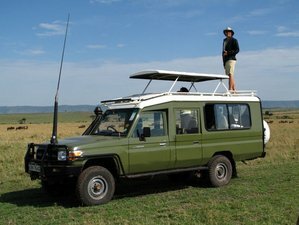 You will have picnic lunch on the way and the journey will take about five hours through the most unexplored and untouched areas in Tanzania. In the afternoon, embark on a boat safari where you’ll admire hippos and crocodiles in their natural habitat. Your meals and overnight will be at Selous Ngalawa Camp. Driving time could be up to 7.5 hours. Breakfast in your accommodation, followed by full-day game drives in the reserve. Selous is a home to large population of elephant, big number of buffalo, and wild dog. Other species commonly seen are the lion, bushbuck, impala, giraffe, eland, baboon, zebra, kudus, and crocodile. You will stay overnight at the Selous Ngalawa Camp. After breakfast, you will go for walking safaris, the most exciting and unique experience in Tanzania, accompanied by rangers armed for about two hours and drive back to Dar es Salaam. Sometimes the guide also performs and it is dressed as a bushman in an authentic African costume. Donatus has the experience in Tanzania tourism industry for more than 15 years, started from northern Tanzania and now based in Dar es Salaam of southern Tanzania and western side of the country. He is also an expert for safaris outside Tanzania in countries like Mozambique, Zambia, Malawi, Burundi, Rwanda, Uganda, and Kenya. This trip will take place in Selous Game Reserve, Tanzania. Selous Ngalawa Camp provides varieties of meals if you book all inclusive with. If you are coming with tour operators, you can have a kitchen and cook your own meals. The breakfast is a buffet consisting of hot cinnamon rolls, eggs and toast, served with coffee or tea, and juices. The lunch is a buffet or a simple packed lunch of sandwiches, fruit, and cakes if you're going out on a full-day drive. The dinner is a three-course affair, often taken out on the terrace under the stars weather permitting. The starters are served at your table, think tempura vegetables or an onion soup with warm bread rolls. The main course is a buffet of various meats, pasta, curries, and vegetarian dishes. The dessert is a sponge cake with chocolate sauce, a little bit bland, although it's hard to get a lot of ingredients so far out in the bush. If you're lucky, the Bushmen may entertain you while you eat and during the walking safari with singing and dancing. Selous Ngalawa Camp offers boat safaris on the Rufiji River, as well as walking safaris, game drives, and cultural village tours.